Crown and bridge procedures provide multiple benefits for your oral health and appearance, from restoring function to the bite to enhancing your smile with a cosmetic touch. Dental crowns and bridges are both restorative and cosmetic procedures, and may be just the treatment you need to return health, harmony and confidence to your smile. Teeth sustaining significant decay, breakage or root canal treatment typically need the full coverage and protection only a dental crown can offer. Once damaged areas are removed and the internal tooth structure built up, Dr. Kayvon Javid and Dr. Mariam Nadi place a highly esthetic, full “cap” or crown over the tooth, returning form and function to your smile. The option of CEREC® same-day crowns adds convenience and high end esthetics to your restorative treatment. 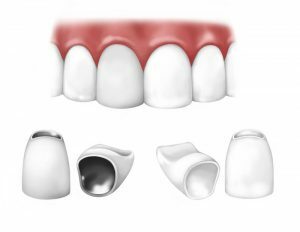 Addressing a missing tooth is an extremely important part of oral health, and is often accomplished with a dental bridge. A bridge spans the space of a missing tooth or teeth, effectively bringing the biting function back to normal and eliminating gaps in the smile. While each end of the bridge sits snugly over teeth adjacent to the open space, the middle portion of the bridge replaces the missing tooth (or teeth). No one will ever know you have suffered tooth loss with beautiful bridge solutions from Drs. Javid and Nadi. Crowns rebuild individual teeth affected by: decay, cracks, fractures, wear, stain and root canals. They are single, natural-looking units identically mimicking tooth structure and rising directly from the gum line. Bridges replace missing teeth by filling in gaps left by tooth loss. They are made of a series of crown units discreetly splinted together, mimicking the appearance of individual teeth, and also rise from the gum line. Bridges rely on surrounding teeth for support. 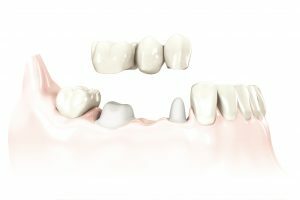 Dental treatment with crowns or bridges may be the ideal solution for rebuilding your smile and bite. For more than 25 years combined, Drs. Javid and Nadi have beautifully restored the smiles of patients with cosmetic and restorative crown and bridge procedures. Dr. Javid refined his skills early on in his career as a faculty member in the University of Southern California’s Restorative Dentistry Division, and remains up-to-date on current techniques through memberships with the Academy of General Dentistry and American Facial Esthetics. Both Drs. Javid and Nadi have an artistic eye for cosmetic dentistry and enjoy restoring function for healthy smiles.